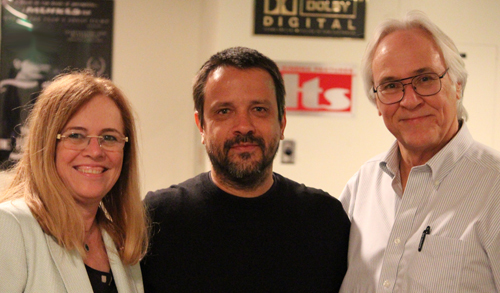 Following a screening of his film “Elis,” Brazilian director Hugo Prata joined UCLA's Randal Johnson in a discussion of the life and times of Elis Regina and the difficulty of making accurate films about historic figures. UCLA International Institute, April 12, 2017—The UCLA Center for Brazilian Studies held a screening of the biopic “Elis” as part of its Brazilian Films Series on April 5. The movie followed the life of the famed singer Elis Regina, retracing both her meteoric rise to fame and the complicated drama of her personal life. The screening was sponsored by the Consulate General of Brazil in Los Angeles, Brazilian Digital Channel International, the UCLA Center for Brazilian Studies and the UCLA Department of Spanish and Portuguese. Held in the James Bridges Theater, the event drew a large crowd of students, faculty local film aficionados, Brazilian diplomats and members of both the Angeleno and Brazilian filmmaking communities. Randal Johnson, a professor of Spanish and Portuguese at UCLA and creator of the Brazilian Film Series, interviewed the film’s director Hugo Prata following the movie, then took questions from the crowd. The large number of Brazilians in attendance reflected Elis Regina’s status as a cultural icon in Brazil to this day. Despite her tragic death from an overdose at the age of 36, she is still considered one of the greatest singers in Brazilian history. A multitude of her songs—such as “Arrastão” and “Águas de Março”—have remained perennial classics not just in Brazil, but around the world. Prata made sure to pepper in Regina’s songs throughout the movie, using her bossa nova and jazz ballads to establish the film’s 1960s and 1970s settings. The casting of the film played a large role in depicting a realistic picture of Elis Regina’s life: multiple people in attendance noted the similarity between the actors and the real people they portrayed. 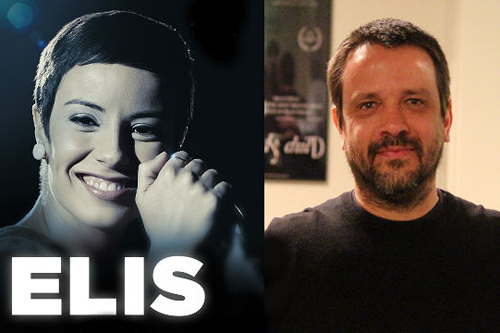 “This was not a lookalike search,” Prata said, explaining that he’d “simply wanted comprehension of the character.” Despite his focus on his actors’ abilities, not their appearance, it was undeniable that the film’s star Andreia Horta held a particularly uncanny resemblance to the real Elis Regina. Prata noted that Horta’s near-flawless reproduction of Elis’s body language and tone of voice was the result of hard work. Horta went through a heavy regiment of daily training with three different coaches in diction, singing, and body movement, respectively. The long hours of practice the actress undertook were evident in her performance: she went on to win Best Actress at the Festival de Gramado, Brazil’s largest film festival. The film was also awarded best picture and best director the same night. Prata; and Randal Johnson, Distinguished Professor of Spanish and Portuguese. One audience member’s question asked how Prata had handled the daunting task of showcasing the entirety of a real person’s life and career within the parameters of a 120 minute film. He responded that he had aimed to stay as true as possible to the life of Elis, although it had been impossible to sustain the film’s story arc and remain completely accurate. “At times, real facts were not efficient,” said Prata, who held firm in his belief that it was necessary to omit elements of Elis’s life in order to more effectively communicate her story to a moviegoer. Prata admitted that the process of deciding which music to use in the movie was his most difficult task. “Out of the 300 Elis songs that I have in my iTunes library, only 12 made it into the movie,” said Prata. He went on to explain that his favorite album by Elis—her 1974 collaboration with Antonio Carlos Jobim titled Elis & Tom—had not actually been included in the film at all, because it was not congruous with the movie’s timeline.